The Buffalo Nickel, which is also known as the “Indian Head Nickel,” is a coin that, according to the United States Mint website, was produced from 1913 to 1938. 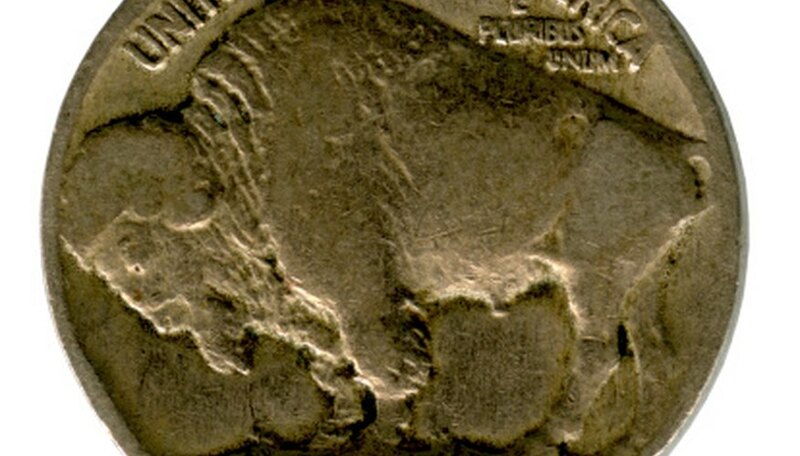 While replica coins have been produced since the late 1930s, the original Buffalo Nickel is a collector's item. Proper cleaning lifts noticeable spots, dirt and similar particles that take away from the coin's natural luster. One must use caution when cleaning the nickel, however, to avoid decreasing the overall value of the coin. Blow dust and other particles off the Buffalo Nickel. This aids in lifting particles off the nickel, simplifying the entire cleaning process. Avoid using compressed air or similar products, as they cause damage to the nickel's surface. Fill a clean bowl with roughly one cup of light olive oil. Soak the Buffalo Nickel in the olive oil for 24 to 48 hours. Remove the nickel from the oil. Wipe it thoroughly with a microfiber cloth. Rinse the nickel thoroughly with bottled distilled water. Avoid tap water, as the natural minerals found in the water leave noticeable water spots on the nickel. Wipe the coin dry with a clean microfiber cloth. Don't worry about getting the coin completely clean. Coins that are aged and “original” are still worth quite a bit of money.